Several of the self-proclaimed militia members occupying Oregon's wildlife refuge were arrested and one was killed Jan. 26. Ammon and Ryan Bundy, who have led efforts to effect federal land policy change while occupying the Malheur National Wildlife Refuge outside of Burns, Oregon, were arrested, along with others, on their way to a meeting about 80 miles from Burns in John Day, Oregon. The Oregon State Police and Federal Bureau of Investigation said in a news release, "One individual who was a subject of a federal probable cause arrest is deceased. We will not be releasing any information about that person pending identification by the medical examiner's office." Another individual sustained non-life threatening injuries and was taken to the hospital, the release said, following the incident that occurred in a remote, wooded area on Hwy 395. The family of Robert "LaVoy" Finicum has identified him as the man who was killed. Jan. 28 the FBI released a video, taken from a law enforcement plane, of the vehicle driven by Finicum through a wooded area on his way to the meeting. The video shows Finicum's white pickup stopping for several minutes just ahead of several police vehicles. Finicum then suddenly begins to drive forward again, and pulls off the road after about one minute to avoid police vehicles blocking the road. He becomes stuck in the snow almost immediately, steps out of the vehicle with his hands up, walks several yards from the vehicle, then turns around and puts his hands near his waist twice, and back up again. He is then shot and falls to the ground. The video does not include audio. According to the official news release, "All of the named defendants face a federal felony charge of conspiracy to impede officers of the United States from discharging their official duties through the use of force, intimidation, or threats, in violation of Title 18, United States Code, Section 372." According to the FBI and OSP news release, these individuals were arrested that day. • Joseph Donald O'Shaughnessy, age 45, Cottonwood, Arizona (arrested in Burns, not in the convoy). The statement concludes, "All defendants should be presumed innocent until proven guilty." The Bundys and other protesters arrived in Burns this winter in a show of support for Dwight and Steve Hammond, a father and son who returned to jail on Jan. 2 to complete five year federal prison sentences for burning about 140 acres of federal land near their ranch. After first serving less than a year in jail, the two Hammonds were taken back to court and were handed the minimum sentence – five years, less time served – required under the Anti-terrorism and Effective Death Penalty Act of 1996, which their case fell under in federal court. Hammond supporters – mostly Oregon area ranchers who believe the Hammonds were not treated fairly in the court system or by the federal land management agency that oversees their lease land – peacefully marched Jan. 2 through the town of Burns to demonstrate their opposition to the Hammonds' prison sentence. That same day, Ammon and Ryan Bundy and an unknown number of supporters traveled to the wildlife refuge to set up camp. Those individuals, usually represented in the media by Ammon Bundy, said they intended to remain at the refuge until federal land was returned to the people of Oregon. Erin Maupin, a rancher outside of Burns, who has publicly supported the Hammond family, said she didn't personally know the protesters and had never been to the refuge. She does not believe very many local individuals were participating in the occupation. "It was time for them to leave," she said. Maupin agreed with the position of the protesters, saying that they had a good message, but that their methods were not necessarily legal. "They should have been arrested for what they did but the escalation of the situation wasn't needed. There were more peaceful options available." Maupin said it had become well-known by the community that Ammon Bundy attended church on the weekend without his body guards. "They could have arrested him, and given everyone else a chance to leave. They had ample opportunity to arrest Ammon." While she had planned to attend the Tuesday meeting in John Day where the Bundys, Finicum and others in their party were headed, she was stopped by police and told that the road was closed. An acquaintance called Maupin late Tuesday evening to ask her to pick up a young woman at the local Safeway who had been in Finicum's car and was released after questioning by authorities. The girls' mother and other family members were in John Day to entertain meeting-goers with family music. According to Maupin, Victoria Sharp, 18, had decided to ride to the John Day meeting with Finicum after her she and her family had visited the refuge the night before, putting on a church service and spending the night before heading to John Day on Tuesday. In a well-publicized audio interview, Sharp details the events leading up to and immediately after Finicum's shooting. Maupin said she heard Sharp report the details four times in the few hours she spent with her, and the accounts were consistent. Sharp tells of the pickup stopping and of both Ryan Payne and Finicum putting hands out the pickup window and asking armed officers not to shoot, saying there were women in the vehicle. After a shot was fired at them, Finicum began driving while Sharp, Ryan Bundy and Shawna Cox got on the floor, she says in the recording. Ryan Payne had exited the vehicle. Nobody in Finicum's vehicle used a firearm, she said. Maupin helped transport Sharp to where she hoped was a safe place. She now doesn't know where Sharp is. Mark McConnell, who was traveling in a second vehicle, with Ammon Bundy, said in a video on his Facebook page that their vehicle was pulled over and he confirms that one passenger of Finicum's vehicle exited and was handcuffed before Finicum took off again. McConnell was released after being questioned by authorities. Another Burns area rancher, Travis Williams said he was one of the last to travel down the road before it was blockaded by police. He made it to the John Day meeting where the Bundys were expected to speak. Because the main speakers never arrived, the meeting didn't include any official presentations, but discussion centered mostly on logging and the local ranchers' and loggers' desire to revive the area's timber industry. "There is very little logging going on there right now," Williams said of Grant County, and it was clear throughout the meeting that many individuals believe that a rejuvenation of the logging industry would benefit the whole community. "The people didn't really talk about Bundy much, they were just wanting to get money back in the county," he said. About 15-20 protesters were standing outside the John Day meeting, holding signs urging the Bundys and their supporters to go home and indicating their belief that Sheriff Palmer was sympathetic to the occupiers. Hans Magden, an area artist, was one of the protesters. "Sheriff Palmer showed he was not impartial and in my opinion he should be removed from office," he said. Williams said that after the meeting-goers got word of the arrest and shooting, the protesters left. One local rancher addressed the crowd on the subject of the armed takeover of the wildlife refuge. Gordon Larson, who lives between Burns and John Day and who ranches on private land that borders federal lands for about two miles, said the Bundys' takeover of the federal building was excessive. "It reminds me of a gang," he said. The former police officer explained that he does not believe the Bundy group deserved the support of locals. He understands the frustration with federal land management policy – he himself suffered significant loss this past summer from fire – but less dangerous methods should have been used to get the point across. "You have to make efforts – there was a place in our history where armed and violent actions occurred because there was no other option, but I don't know that we've exhausted all of those options now," he said. "That's why we have a Congress." Larson says he has lobbied on the state and national level, and garnering attention for a cause is not easy, but working through the system is a better and safer route than the Bundys and their followers took. An unarmed civil disobedience march or sit-in would have caused the protesters to be arrested and given them an opportunity to speak in court, he points out. Larson said rural people tend to take others at "face value" and want to help out anyone they can, and maybe were too quick to support the Bundy group before determining whether or not the protesters actually represented them. "Before you align yourself with someone, make sure they represent the same values as you." The shooting of Finicum was a real tragedy that could have been prevented if the protesters had chosen not to arm themselves, he said. Williams had been to the refuge three times since the occupation began. He had chatted with Bundy, Finicum and others, saying they were "a good set of people" and that he never felt threatened while visiting. The last time he stopped in, Williams, a member of the newly formed "Committee of Safety" in Harney County, said he delivered a letter kindly asking the protesters to leave. "We wanted them to go home so we could work on what we wanted to do." And now Williams hopes the feds will go home, so everyone can get back to work. "I don't want Harney County going back to how it was. I'd like to go back to work on this dream of having our resources back – putting money back in to the counties around here. I'd like to see if we can get that done." Williams hopes all or most of Oregon's counties with large percentages of federal lands will put together plans for more local land management. "We do have grazing rights on that ground that are more valuable than the ground itself," he said, adding that he hopes to somehow effect policy change that puts the land under county, rather than federal management. "Oregon is losing $2 million per year on land management. Once we get up and going the counties and state could be making two to three times that much." If ranchers knew their grazing fees were going to support local activity like schools, hospital and county needs, most would not mind paying higher fees, he said. "I'm sure people would step up and pay." There is a very limited tax base in many Eastern Oregon communities composed of a majority of federal land, he said. One idea would be to change the grazing fees from a flat per-acre assessment, to one based on the calf market, Williams said, and he foresees many of the current Bureau of Land Management (BLM) and U.S. Forest Service (USFS) staff being retained, but hopefully being paid and overseen on a more local level. While the protesters were mostly from outside of her home state, and Maupin did not necessarily support their tactics, she appreciates those individuals for their bravery and their ideas. "They opened our eyes to show us that we don't have to just take it all the time, that we need to start coming together as a community and stand up for what we believe. I'm not talking about an armed takeover of a federal building , but we learned a lot about the constitution from them. "It's a sad day when you have terrorists that have been killing people that are being released by the government and then you charge ranchers (Dwight and Steven Hammond) as terrorists and shoot and kill one (Finicum). That's a sad day for our country. Williams pointed out that the Hammond family is still front and center in his mind. "We are trying to help them out however we can," he said, adding that he believes their attorneys are seeking clemency and that the state cattlemen's group is working to help reinstate their grazing leases. 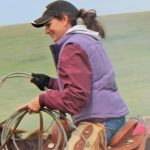 "If nothing else comes of this, we learned that ranchers have to stick together and not let them run us out of business one by one," said Maupin. She hopes some good can come of a tense and tragic situation, and said she doesn't support the occupation or armed protest, but understands their level of frustration. "What are we supposed to do as rural communities? It doesn't work to vote because we are outnumbered. It doesn't work to sue the government, we have no chance. It doesn't work to sign petitions – there are a zillion petitions and they don't work. I don't think the public understands the frustrations involved when these things are happening to rural folks and we feel like nobody will stand up for us. I can see where the Bundys reached the point that they did what they did – not that I agree with what they did."